As some of you know, Granny Rocks — also known as Beth Green — has been chronically ill for over 57 years. She was being trained as a classical pianist, but at the age of 15 she became too sick to continue and she could no longer play the piano or do music. In her mid-50s, electronic instruments became available and she started to be able to compose using a computer. But she still couldn’t play an instrument. Every time she tried to play, she became crippled again. About a week ago, she heard about a new keyboard, a Roland RD2000, and for some reason, the magic happened. She bought it and started to play. Since then, she has begun to touch the keys and practice the piano. Less than a week later, she played live for some friends via YouTube Live. Her physical therapist was with her in the room and she worked on her arm so that Granny was able to play. We were all stunned — especially Granny. Not only has she been unable to play the piano. She has always been terrified of playing live — even from childhood. Well, the miracle happened. She relaxed and improvised two songs, and here they are. 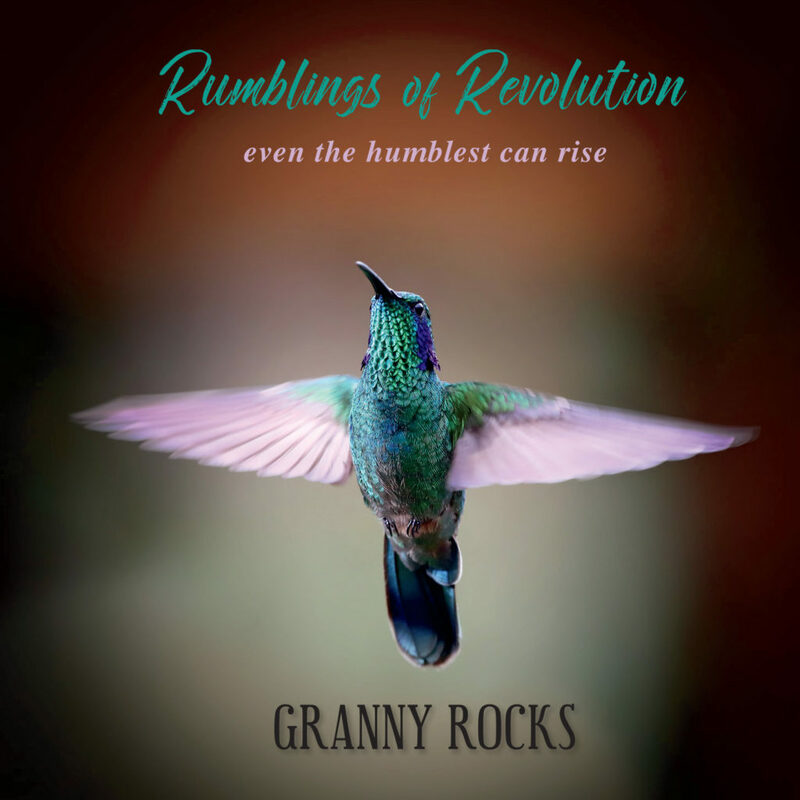 Granny Rocks’ symbol is the hummingbird, and she loves to say that the hummingbird defies gravity, and so does Granny Rocks. We think this video proves it. Fifty-seven years after she had to quit playing the piano, she felt like she had returned home. Watch all her music right here, check out her Facebook page, http://facebook.com/grannyrockson, and check out her website: http://GrannyRocksOn.com. Granny Rocks: The Music & the Message. Granny is also known as Beth Green, founder of TheInnerRevolution.Org. Check out her other channel, too, with over a hundred videos on a wide variety of topics. Go to http://youtube.com/forunity. Your hands move so elegantly!! What was the ‘thing’ about todays instruments that kept you from playing in the past but allows you to play today?? I didn’t even realize that I had accidentally allowed comments here until I saw this, and I want to tell you that your comment made my day. Thank you, thank you, thank you. Now to your question: I’m not sure myself. I was weak and prone to illness as a child and could never play very well technically since I lacked strength. When I was 15, I contracted rheumatic fever and was confined to bed or a chair for a year and a half and given all kinds of misguided treatment. I was never the same — not even back to my old weakness and bad health. I became pretty much completely disabled. When I tried to play the piano again, my muscles went into spasm and didn’t bounce back. I turned away from music altogether, but as I mentioned, in my 50s, I would use the computer to edit. So I would lay down some notes and then have to edit every one of them. Recently I saw a mystery that focused on young pianists in a conservatory-type setting, and it brought me back to my childhood. Before my new Roland, I had been using a semi-weighted keyboard for composing — much easier to play, but still extremely difficult for me. But it didn’t sound like a real piano and it didn’t feel like a real piano. The mystery triggered the old pain of losing the piano, a pain I didn’t even realize was there. I started practicing on my semi-weighted keyboard for two days, and I felt inspired. I also was sick of having to use the computer to play music. There is always a computer glitch to deal with, and in fact, Windows had done an update and I was cut off from playing and composing. I started having fantasies of an instrument, an instrument you didn’t need to hook up to a computer, a baby grand piano. That was insane, of course. But through a series of coincidences, I read about this keyboard — that it sounded and felt like a real acoustic piano. I couldn’t help myself. I asked my husband to drive me to town to see … what, I didn’t know. I cried all morning before we got there. I had finally grieved the piano, my first form of self-expression, my connection to the universe. And when I got there, I heard the piano, touched the keys and fell in love. It made no sense and it still doesn’t. After playing a while, it hurts. I need physical therapy to keep going (I broke my right arm 6 months ago and am still struggling anyway, but I get PT for the break. How lucky, huh?) And I have to play for a while and then stop again for a couple of days. But I’m managing. I am noticing signs of getting crippled again, but when I do, I stop. I love this piano. The keys are weighted like a real piano’s, but they are a relatively light touch, and the sound moves me. It’s still electronic, and I have to hook it up to powered speakers to get great sound, but it’s not a computer. It’s not weird and glitch. When I played that day, I was in an altered state of consciousness, and sometimes my fingers run up and down that keyboard like I’m not stiff and in pain. Other days, I feel like the regular me, barely able to lift my spoon to my mouth. But I have gotten support to sit at the right angle, with the correct ergonomics, and I stop myself when I have to, and I’m in it for the long run. I still have fear that the new piano will be taken away from me. It’s not the money, though buying it was insane for us; it’s the fear that one more time, my body will crash. I am used to living in pretty much constant pain. Writing books has been crippling, and sitting is a nightmare. But then I have these moments with this piano, when I am so deep into myself that I am able to be in a quiet space, away from the pain and anger of humanity, and I feel free. Laura, I am a very intuitive person, and I feel the world’s pain. When I played that day, I told myself that I was there to speak to humanity, to share and not to perform. The miracle happened. I hope I haven’t bored you with all this, but I didn’t know how else to answer you. I hope that you have or that you can find something, some way, to access that deep part of you where you feel safe to be yourself and share it with others. Many hugs to you.